Cut avocados in half and remove pit. Gently combine sweet onion, cilantro and crab meat. Scoop mixture into cut side of avocado halves, filling the pit cavity and creating a mound about the size of the missing avocado. Wrap each stuffed half with two pieces of bacon, using toothpicks to secure. Place stuffed avocados on grill and heat until bacon is done to your liking - probably 20-25 minutes. In 3 separate shallow dishes, mix the spices and flour, beat the egg with the milk, and spread out the crumbs. Dredge your clean clam filets first in the seasoned flour, then in the wet mixture, and finally in the breadcrumbs. Fry clams in hot vegetable oil in a frying pan, on medium, until the are golden brown and crispy (2-3 minutes per side max). Let them drain any excess oil on paper towels. On the grill, or in the oven, caramelize the tomatoes and jalapeños whole, and the 2 halves of the onion. They should be heavily roasted (you will see black on all the veggies). Quickly run your knife through the veggies to chunk them up into small pieces (careful: hot! ), leaving the jalapeño stems out. Combine them in a food processor, with the cilantro and the juice from two limes. Burr-mix the veggies until you get your desired texture (I like mine to look like rough soup). Stir in the salt, pepper, sugar and vinegar until just right! Squeeze the juice of one lime into your sour cream and whip briskly with fork to combine. Now you have lime crema! Stack your different types of tortillas and wrap each stack in foil. Let them warm up in the oven at 350 degrees for about 10 minutes (they should still be soft when you take them out of the oven). Assemble your tacos! Layer your tortillas with the clam filet first, with as much of the toppings as you like (I go kinda easy on the toppings, I want the CLAM to stand out). The contrasting flavors and textures of the two different tortillas are awesome and the salsa and crema are a must. Small dabs of each. You should have one lime left over to cut into wedges and squeeze on top for some extra brightness. Enjoy these delicious (and muy autentico) New Mexican style clam tacos. 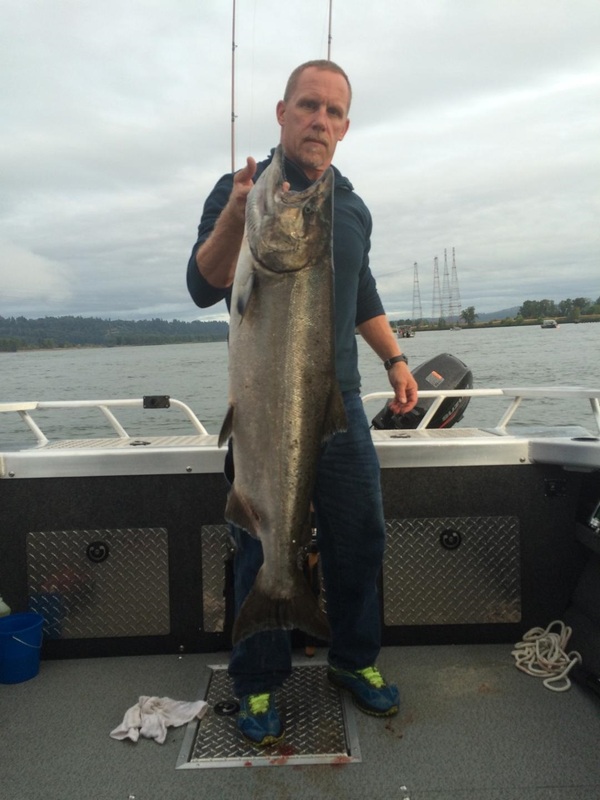 My 24 lb chinook salmon this September 2016. Dry fillets. Make thin batter (as it thickens on standing). 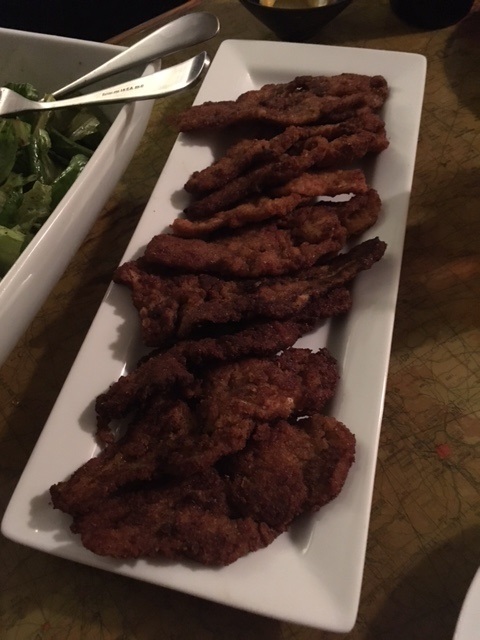 Dip fillets in batter and fry quickly until golden brown in 1 inch hot oil. Turn fish. Remove from oil and rest on paper towels. Serve immediately with lemon. 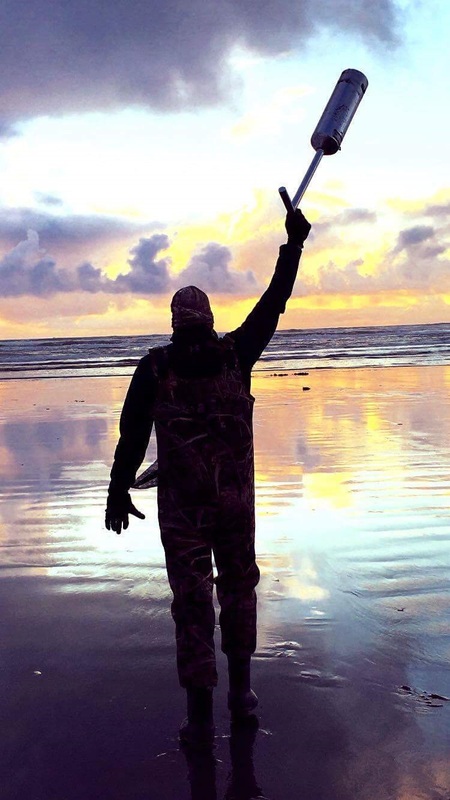 The Hunt for Salmon is On! 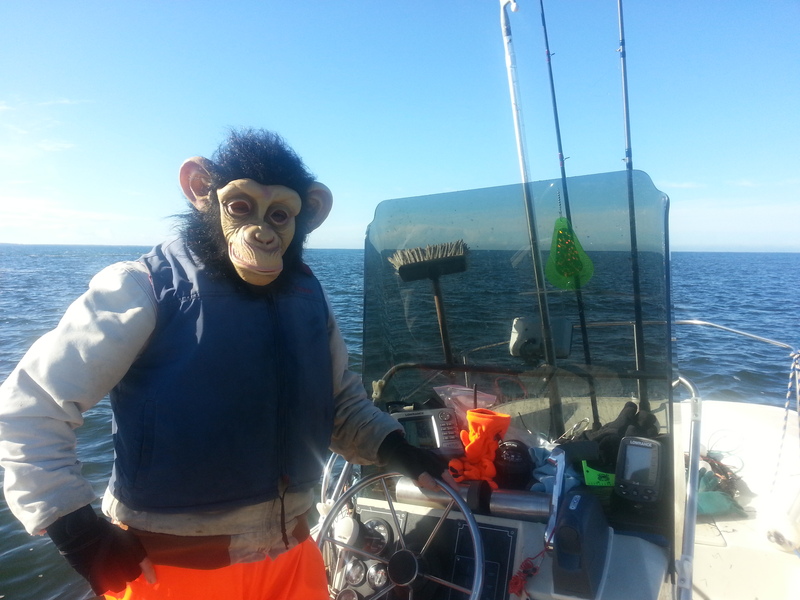 Salmon fishing is opening up in the bay - if we would just stop monkey'n around, we might find one! 1) In large bowl combine all of the ingredients for the salsa and stir together until combined. Let rest. On rimmed baking sheet, combine broccoli, carrots, mushrooms, olive oil, salt and pepper. Mix thoroughly to make certain all vegetables are coated. Arrange in center of tray in a flat layer. Lay the 2 salmon fillets on top of vegetables. In medium bowl: Combine brown sugar, soy sauce, mustard, honey and sesame seeds. Whisk until there are no lumps. Spread glaze over salmon fillets. Remove salmon from vegetables onto plates. Toss the vegetables in roasting juices and transfer to plates. Glaze salmon with any remaining juices. Excellent with a side of wild or brown rice. 1. In a Dutch oven or kettle, cook bacon until crispy. Add onion until the onion is translucent. 2. Stir in potatoes, water, salt, marjoram, and pepper. Bring to a boil; reduce heat. Simmer, uncovered, about 15 minutes or until potato is just tender. 3. 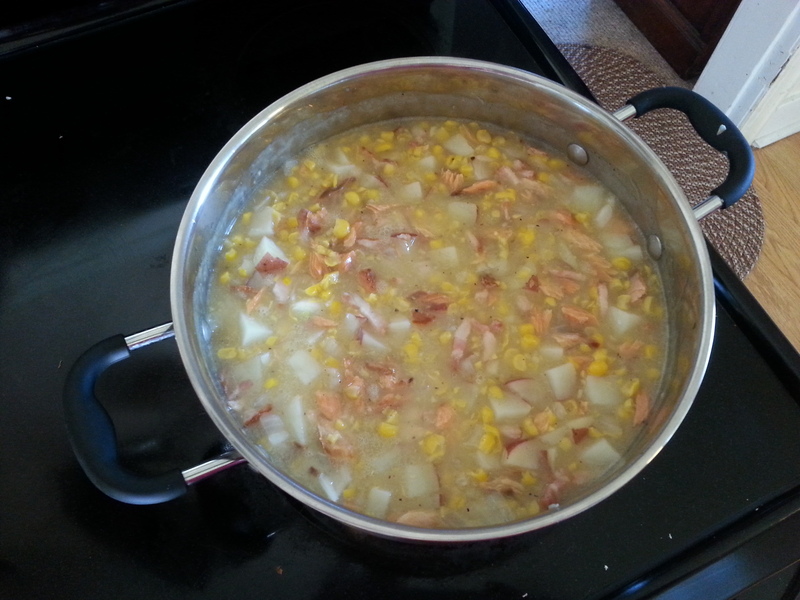 Add the smoked salmon, cream-style corn, whole-kernel corn, and the evaporated milk. Heat through. Makes 6 servings. 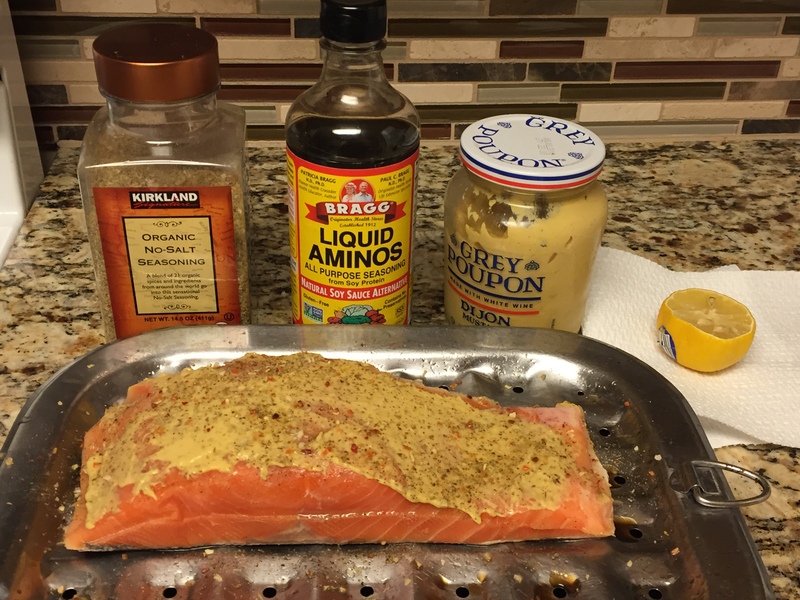 Drizzle salmon generously with Bragg's Liquid Amino Seasoning - let sit for 5 to 10 mins. 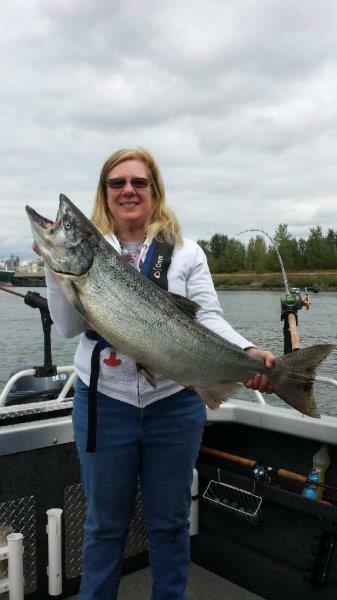 Bake at 400 degrees for approximately 20 mins, or until salmon is no longer dark pink. Let sit for 5 mins prior to serving. Enjoy with your favorite salad and greens.